Used often in discussions about a physical yarn shop vs. an online store. Seen in groups and forums for people looking for a specific yarn or pattern that they are having trouble finding and want the help of others to obtain it. 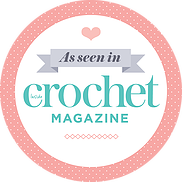 A fun event held by an individual or a company where everyone who joins crochets the same thing at the same time (usually) and share the experience together by providing comments, questions, and photos. Sometimes a prize is involved! Often found in the rules of a forum/group specifying they will not tolerate off topic comments. Or, you may simply see it in individual posts by people indicating they realize they are going off on a tangent with their comment! These are completed projects. Often seen in forums and groups that want you to share photos of your finished crochet and knit items. Used when referring to a project you are currently working on but haven’t completed yet. Like WIP above, but often neglected or abandoned all together. Also similar to WIP above, it is the project that is currently on your hook that you are in the middle of crocheting. On Ravelry you can make some of your items (including yarn in your stash) available for sale or for trading with other members. The profile photo of a ravelry member. This is the term used when you want to reduce your yarn inventory (or stash) – either by throwing out, selling, trading, or giving away the yarn you don’t want anymore. There are whole forums dedicated to destashing. I think this is a very common term in the knit and crochet community, but when I saw it on Ravelry I had to look it up! It refers to a project you undid, either slightly to fix a mistake, or completely to abandon the project. You can change the status of your ravelry project to “frogged”, which means you took it all apart and decided not to make it anymore. Supposedly the term came around because when you make a mistake you “rip it” out, which sounds like the frog noise “ribbit”! These are the main terms I came across when first exploring ravelry and the ones I think are most useful for those just starting out. For a complete list of terms that you may encounter, check out the main glossary page: Ravelry Glossary.